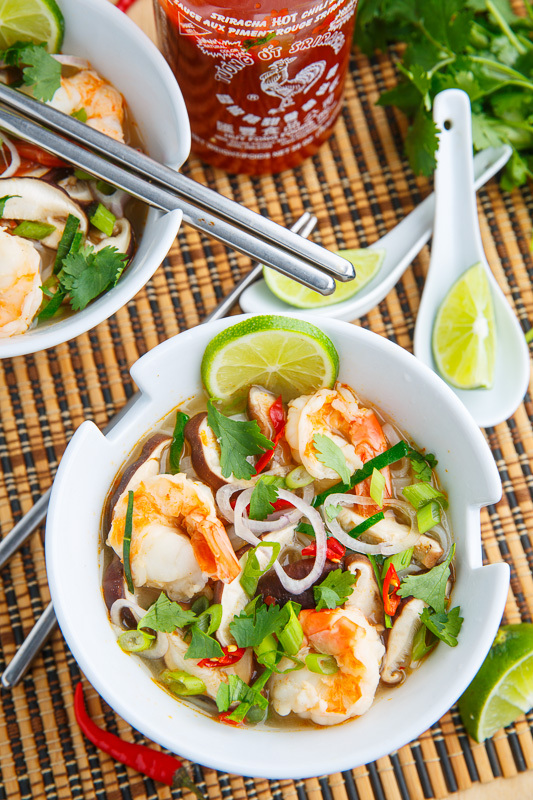 A light, and tasty Thai style hot and sour soup with plump and juicy shrimp! 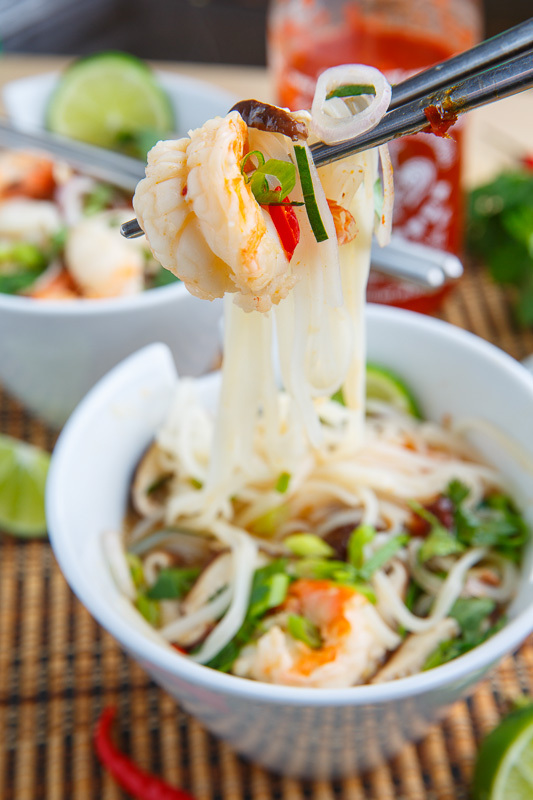 With all of the good food over the holidays I want to eat a little lighter these days and with the cool weather I was thinking that it was the perfect time to make some of my favourite soup, this tom yum goong soup, aka Thai style hot and sour shrimp soup. 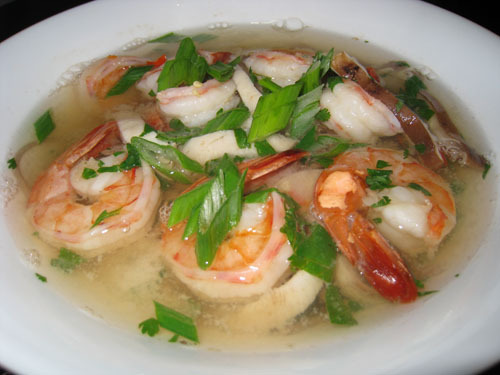 At it’s base this soup consists of the hot and sour broth along with plenty of shrimp! The heat in the soup comes from chilies and/or chili sauce/paste and the sour comes from fresh lime juice and in typical Thai fashion these are balanced and contrasted by saltiness from fish sauce and sweetness from palm sugar. The soup is further flavoured with shallots, lemongrass, lime leaves and galangal (or ginger) which when combined with the fresh cilantro and green onion garnish makes this soup super fresh and bright! You can of course change things up by adding extras like mushrooms, vegetables, noodles, coconut milk, etc. as desired! 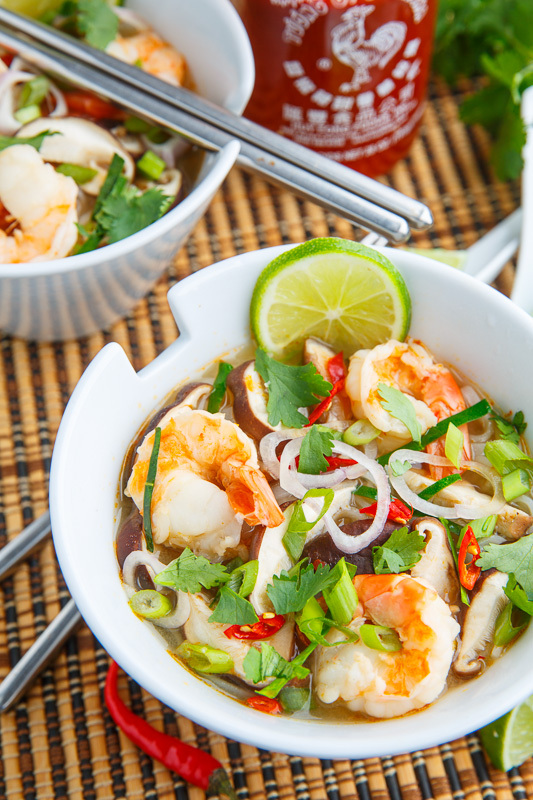 This bright thai hot and sour shrimp soup is perfect for chilly grey days! 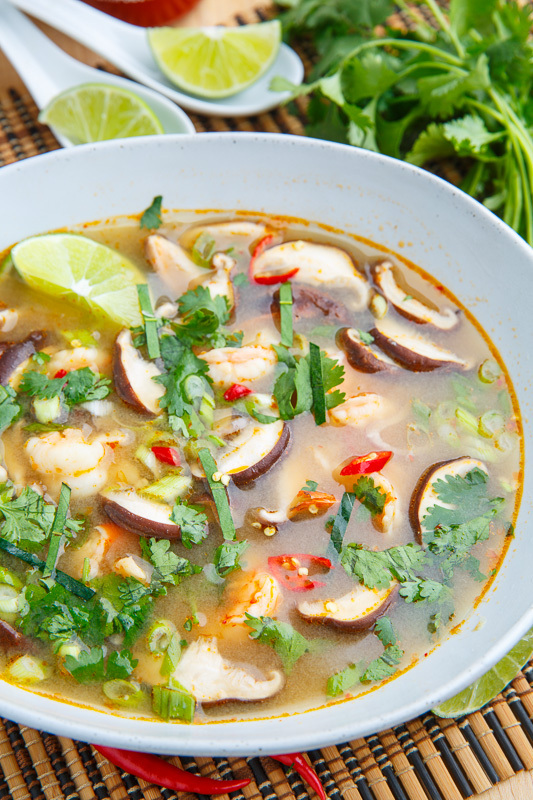 Bring the broth, water, shallots, lemongrass, lime leaves, chilis, galangal and shiitake mushrooms to a boil, reduce the heat to reduce to a simmer before adding the shrimp and simmering until cooked, about 3 minutes. Season the broth with the lime juice, fish sauce and sugar, taste testing for a balance of sour, salty, sweet and spicy. Serve garnished with cilantro, green onions and chili sauce as desired! Option: Simmer the shrimp shells in the chicken broth for 10 minutes to infuse the broth with shrimp flavour! Option: Add 8 ounce rice noodle just before the shrimp and cook until just cooked. Option: Add coconut milk to the broth to make it nice and creamy! Kevin, I’m stuffed from dinner but I’d make room for that warming soup…go nuts with the shrimp – luv it! Oooh looks delicious, Kevin! And so comforting. Maybe it’s a good thing you left out the pepper paste – did you hear about police & firefighters in London closing streets and smashing doors because of a “chemical attack”? I LOVE this type of soup. It’s one of my very favorite soups to order in a Thai restaurant here where I love to eat. No noodles for me though, I put rice in the bottom of the bowl and then put the soup on top of it. I don’t know if that’s how it’s eaten in Thailand, but I like it that way. What a great photo of the soup! Yum! i love tom yum soup. i usually like it hot and my soup base look a little more reddish, i guess i just like to use more paste :)The noodles soak up the flavour and end up tasting so divine. This looks so fresh and warm and comforting all at the same time. Even though I have to admit that I don’t recognize half of the ingredients in this soup, it looks delicious! The soup looks delicious! The perfect dinner on a cold winter night. Thanks for dropping by my blog. I’m glad you did, because now I’ve discovered yours! 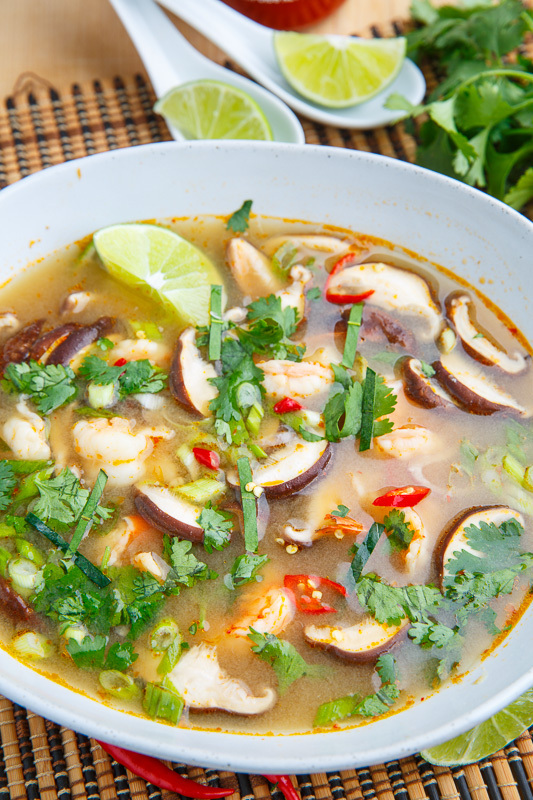 I love Tom Yum Goong soup, especially on winter days like today (it’s snowing AGAIN as I type this!). Never tried making it, though. You make it sound very easy and very delicious. Another wonderful soup, I can have soup every day of the week. Love them, thanks for sharing. I am a huge fan of tom yum soup. I miss being able to get it from the restaurant just a block from my home in Chicago. Getting it in Ghana is a bit more tricky, so thanks for passing on the great looking recipe! That’s one of the things I have ordered many times at a restaurant,. but never actually made at home… looks delicious and suiting to the cold. Boy does that soup look good! Soup looking delicious.. thanks for sharing this . This has been pinned and will be made soon. It looks SO delicious! !